This adorable musical jewelry box armoire makes a perfect gift for a baby or as a birthday gift! 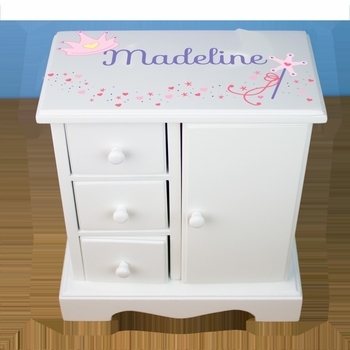 Each comes with custom personalization on the top of the box and includes the baby’s name along with the cutest artwork you choose from over 70 designs! Features three drawers and side compartment with convenient necklace carousel. The inside of the box and drawers are lined in pink velveteen and the integrated music box plays "It's a Small World" when the bottom drawer is opened. Box measures 9 by 7 1/4 by 3 1/2 inches. See More Images above for more pictures.